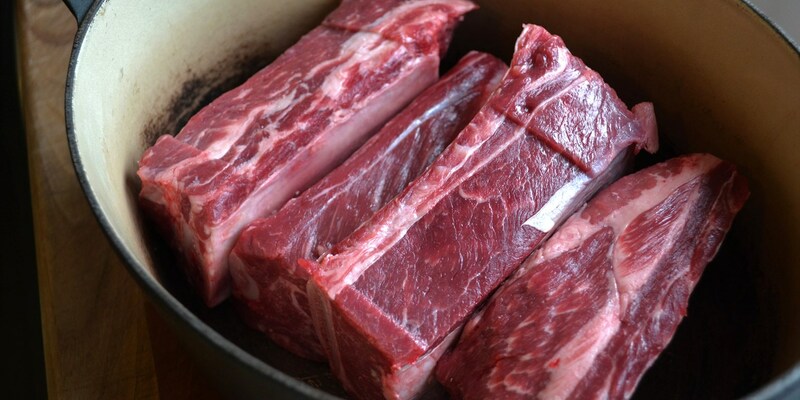 Beef short ribs were once one of butchery's best kept secrets – incredibly tender, melt in your mouth beef that was available at a very reasonable price. They're not quite the secret they once were, but they're no less delicious, and all that's required is some time and attention to create absolutely jaw-dropping dishes, as evidenced in this collection of beef short rib recipes. Thus cut is incredibly versatile when it comes to flavours. Adam Byatt takes a more classical approach with his Beef short rib and onion cottage pie, as does Russell Bateman for his dish of Sous vide Jacob's ladder, Jerusalem artichoke chips and Roscoff onions. Meanwhile, there's Asian-style barbecued beef short ribs by David Everitt-Matthias and Short rib birria tacos with black beans and chipotle jus from Nud Dudhia, which both take inspiration from Global cuisines. Whatever you choose to do with your short ribs, low and slow cooking is the key. Lots of our chefs choose to marinate or brine the meat first for extra flavour, before braising over a long period of hours. Searing the meat first will add extra flavour and colour to your final dish, too.